The Society of American Archivists (SAA) is a professional association organized in 1936 to continue the growth and advancement of the archival profession. It was founded to “promote sound principles of archival economy and to facilitate cooperation among archivists and archival agencies.” The SAA is open to archivists responsible for all sizes and kinds of archives (for more information, see http://www.archivists.org). Because archives are the repositories for all varieties of records, photographs, maps, notes, and journals as well as three-dimensional objects (which may be artifacts or in some cases, human remains), the SAA hosted a meeting with Native Americans, historians, and archivists in order to discuss a more even-handed approach to the Native American materials held in their archives. The proposed Protocols for Native American Archive Materials were posted, and comments from interested parties were sought (see http://www2.nau.edu/libnap-p/protocols.html). The Board of Trustees of the Ohio Archaeological Council decided that it was important to send our comments to the proposed Protocols, because in many cases archaeologists spend great amounts of time searching archives for information to assist us with our interpretation of the past. Although the Trustees believe that the framers of the Protocols are to be commended for their desire to be inclusive, there are several portions of the Protocols that disregard the interests of other stakeholders. 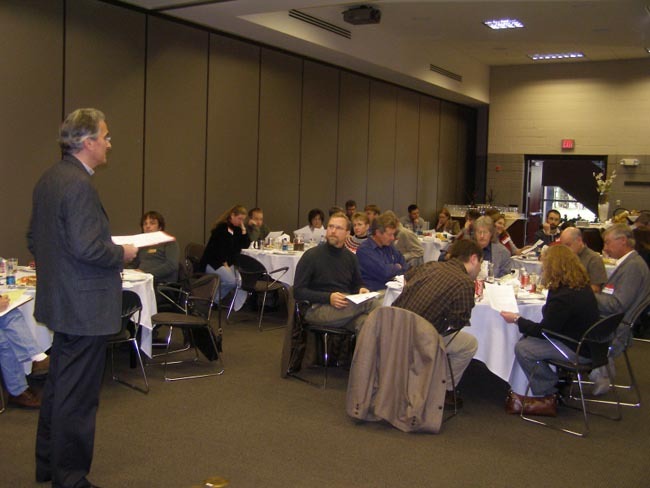 The Ohio Archaeological Council (OAC) is a private, non-profit, scientific, and educational membership organization whose mission is to promote the advancement of archaeology in Ohio. The majority of our members are professional archaeologists working in private, for-profit cultural resource management firms and private and public sector, non-profit universities, museums, and government agencies, some of which are defined as museums and Federal agencies in the Native American Graves Protection and Repatriation Act (NAGPRA). While few or none of our membership are members of the Society of American Archivists (SAA), many of the institutions with which our members are associated contain archival materials, which are encompassed by your draft "Protocols for Native American Archival Materials." Moreover, all of our members rely on these materials to interpret America's ancient past. Therefore, we see ourselves as important stakeholders in this discussion. In the spirit of the statement on your website, in which you "…call broadly for comment on the Protocols because the Protocols encompass some significant and substantial changes in archival theory and practice," we offer the following comments, because the changes proposed will profoundly affect the ability of archaeologists to access and utilize the critical information on America's ancient past housed in archives across the United States and Canada. We note that no archaeologists are represented as contributors to the development of the Protocols and would urge you to seek further comment from archaeologists, historians, and other stakeholders outside of your organization before you formally adopt such "significant and substantial changes in archival theory and practice." Many of the recommendations contained in this document are worthwhile improvements in the handling of Native American archival materials. A few are worrisomely ambiguous and others are extremely problematic. On page 2, the document indicates that “Institutions and communities are encouraged to adopt and adapt the culturally responsive recommendations to suit local needs.” This attitude is commendable on the face of it, but is possibly dangerous, in that it will result in these recommendations being applied in an unequal fashion across the United States and Canada. The application of NAGPRA itself is subject to “revision and enhancement,” but only through legal processes. On page 6, in the section “Building relationships of mutual respect,” the document suggests that, “if a Native American collection is out of scope, transfer the collection to the community or the closest archives at the tribe or band’s request.” Since such an action could remove irrevocably the material from a publicly accessible archive, the decision making process should include an independent assessment of its historical significance. On page 8, the document offers an analogy between extant archives of "restricted materials, classified materials, secret materials, or materials that may not be accessed until some future date" and culturally sensitive Native American material that might be "restricted or repatriated to the culturally affiliated group" or even intentionally allowed to degrade. The OAC considers this analogy to be invalid. The examples offered demonstrate that library/museum archives have the operational means to restrict access to certain materials, but they do not provide a justification for doing so in this case. We believe it would be unethical for a library, archive, or museum to allow materials held in the public trust to be indefinitely restricted from the public, surrendered to special interest groups, or destroyed in the furtherance of narrow and unspecifiable ("secret") cultural/religious interests. On page 8, the document urges archives and libraries to conform policies relating to the access and use of relevant collections to "Native American approaches." In at least one case with which we are familiar, menstruating women were to be kept from certain materials. The OAC regards such a policy as sexist, patronizing, and an outrageous invasion of privacy. If an archive or library attempted to enforce such a policy, it could be subject to legal action. Yet this is the sort of thing that blind conformance to "Native American approaches" conceivably might entail. On page 10, it is not clear what is meant by the statement that archives and libraries should "rethink the need for 'credentials' from patrons"? Does this mean that if access to a collection were restricted to "Native Americans," then anyone who identified themselves as a Native American would be allowed access to the material? NAGPRA regulations require that museums and Federal agencies interact with federally-recognized tribes and nations. Consultation with and subsequent repatriation to groups that are not federally recognized (i.e., state recognized tribes or groups) could create difficulties in subsequent collaboration and consultation with those groups that are federally recognized. On page 12, the examples of "kinds of archival materials" that "may be culturally sensitive from a Native American perspective" include "human remains," "archaeological objects (especially if from burials)," and "archaeological data." The tone of this document suggests that access to all such material reasonably might be restricted by archives, libraries, or museums. NAGPRA requires that groups claiming human remains for repatriation must be able to demonstrate that they are culturally affiliated with those remains. These protocols at least should require a similar demonstration of relationship before public access and institutional control over archival materials are relinquished. Regardless, the idea that archaeological data, reports, and photographs (usually funded with public money) routinely could be sequestered and even removed from publicly accessible archives is deeply disturbing. Such a policy could be devastating to disciplines such as archaeology and history. On page 13, in the section titled “Providing Context,” it is suggested that archivists “remove offensive terms from original titles and provide substitute language (e.g., replace “squaw” or “buck” with [woman] or [man]).” While it is clear that such terms are offensive at this time to many (including many non-Native American peoples), actually changing the wording of documents that are a product of their time is reprehensible. This type of editing applies current-day morals and standards to documents that were created in the past. Rather than participating in this kind of censorship, it is our opinion that the archive should “add explanations of derogatory words to original titles (e.g., [title created by xxxx in xxxx year]).” In this way, the document will continue to exist in its original format, which is a part of the purpose of archiving a document. The OAC commends the SAA for its work of consulting with Native Americans regarding the materials, which they regard as sensitive, held in archives across the United States and Canada. Archaeologists, museum curators, and Native American representatives have had nearly 20 years of working with each other during the implementation of NAGPRA. This law, while not considered perfect, has provided a way for the people and institutions that are integrally involved in preserving the past for the future to develop mutually beneficial partnerships with Native Americans. The Protocols are a commendable step in the same direction, but should be considered carefully prior to their implementation. Implementing the Protocols as currently written could result in the irreparable loss of much hard earned knowledge about ancient and historic Native American cultures. The OAC urges the SAA not to follow such an extreme course without undertaking more extensive consultation with stakeholders, such as archaeologists and historians. Making the changes proposed without this consultation will hurt all future attempts to reconstruct or understand entire past cultures, thus affecting the shared heritage of humankind. 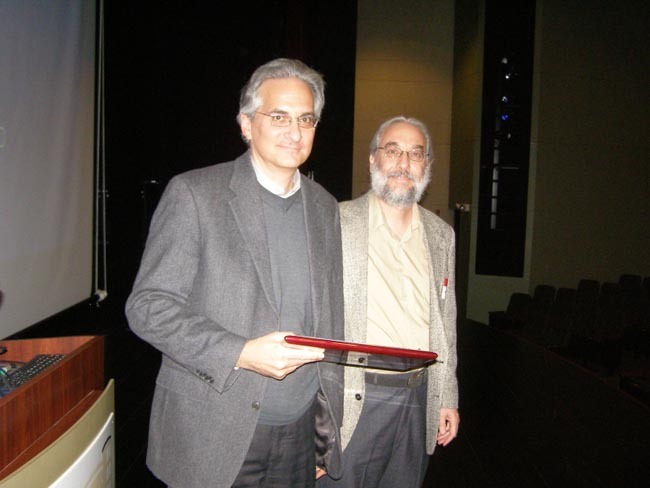 At the 2007 OAC Fall Membership meeting, President Elliot Abrams presented John Hancock with the OAC's 2007 Board of Directors Award in recognition of his significant contributions to the advancement of Ohio archaeology through his work with the Center for the Electronic Reconstruction of Historical and Archaeological Sites (CERHAS). Prior to receiving the award, John Hancock addressed the OAC business meeting luncheon with an update on a current CERHAS project. OAC Comments on Senate Bill S. 2087 and NAGPRA Definition of "Native American"
As the President of the Ohio Archaeological Council (OAC), which represents the interests of professional archaeologists in Ohio, I write to you concerning Senate Bill S. 2087 currently being deliberated in the Committee on Indian Affairs. I understand that you do not serve on the committee. Nevertheless, as one of Ohio's Senators, I wanted to inform you of the OAC's concerns with regard to this bill in case it should be approved by the Committee and proceed to a Senate vote. The provision in Section 2 of this bill effectively seeks to alter the definition of "Native American" so as to violate the spirit of the term as defined in the Native American Graves Protection and Repatriation Act (NAGPRA). Specifically, this provision would change the definition of "Native American" from "...of or relating to, a tribe, people, or culture that is indigenous to the United States" to "...of or relating to, a tribe, people, or culture that is or was indigenous to the United States." The exclusive use of the present tense in the original definition is critical and it was determinative in the Kennewick Man case. Magistrate Judge Jelderks, as well as the judges in the appellate court, concluded, based on NAGPRA's definition, that Kennewick Man did not have a demonstrable relationship to an existing cultural group and therefore was not subject to NAGPRA. To assert that Kennewick Man has no such relationship to any particular existing group is not to claim that he is unrelated to any extant Indian tribes, or that he is not "Native American" in a common, or anthropological sense of that term. But the legal definition of "Native American" for the purposes of NAGPRA was intended by Congress to restrict its application to protecting the human rights of existing Native Americans. The proposed addition of the words "or was" reflects an attempt to expand NAGPRA beyond its human rights objective in a way that will interfere with scientific efforts to learn from ancient human remains that either are unrelated to any living person or group, or are related to virtually all living Native Americans and so should not be subject to potential repatriation to any particular group. Moreover, the revised definition of "Native American" could encompass any possible pre-1492 Asian, Norse, or Polynesian human remains that might someday be found in the United States as well as (and even more likely to occur) human remains from previous migrations to the Americas that were unsuccessful, and therefore were not ancestral to modern Native Americans. Considering any of these cases as "Native American" for the purposes of NAGPRA would constitute an absurd result and clearly would go beyond Congress's intention to protect the human rights of living Native Americans. If enacted, Section 3 of S. 2087 will have a dramatic and deleterious effect upon the ability of scientists to conduct scientific studies of ancient human remains. We assert that the current definition of "Native American" contained within the NAGPRA legislation already serves adequately to identify the human and cultural remains of those peoples whom it was designed to protect, those with a demonstrable link to modern descendant groups. Moreover, it accurately represents the original consensus of Native Americans, archaeologists, physical anthropologists, and museum professionals who worked together to craft the NAGPRA. If this bill is approved by the Committee on Indian Affairs and proceeds to a vote, I urge you to vote against it. In response to your letter dated 26 July 2007, the Ohio Archaeological Council (OAC) wishes to submit the following information for your review regarding the Fallon Paiute-Shoshone Tribe's claim of cultural affiliation with the set of human remains known as "Spirit Cave Man." Since the BLM's original determination that the Tribe is not demonstrably culturally affiliated with Spirit Cave Man was made prior to the Ninth Circuit court's decision in the related Kennewick Man case, and since that decision raises points of law and evidence not treated by the BLM in its original determination, it is appropriate for the OAC to revisit the factual claims the Tribe has offered in support of its claim of cultural affiliation. The Fallon Paiute-Shoshone Tribe offered a series of arguments based on archaeological data that they claim demonstrates that Spirit Cave Man is “Native American” for the purposes of the Native American Graves Protection and Repatriation Act (NAGPRA) and that these 9,000-year-old human remains are culturally affiliated with the Fallon Paiute-Shoshone Tribe. Based on our assessment of the archaeological data, the OAC concludes there is no credible archaeological evidence to support the assertion that the Spirit Cave Man remains are “Native American” (within the meaning of the Ninth Circuit’s test in the Bonnichsen case). Moreover, there is no support in the archaeological data for a “shared group identity” between the Fallon Paiute-Shoshone Tribe and whatever group to which the Spirit Cave Man might have belonged. We consider the arguments and evidence in the same order in which they are presented in the Tribe’s lawsuit. Response: “Asian origin” does not mean the same thing as “Native American,” particularly as that term is used in the NAGPRA. There could have been groups of early Asian people who migrated to America that did not give rise to any contemporary Native American tribe. Such groups might have died out or been absorbed by a neighboring group thereby losing much, or all, of their original cultural identity. Regardless, a finding that Spirit Cave Man's ancestors were from Asia is necessary but not sufficient to establish that he was a "Native American" for the purposes of the NAGPRA. 2. Claim: The dental pattern exhibited by the Spirit Cave Man is one commonly found in Northeastern Asians and Native North Americans. Response: If the observed dental pattern is “common” among both Northeastern Asians and Native North Americans, then it is demonstrably not a characteristic only of Native Americans. The same arguments presented in the response to the first claim apply here as well. Response: This supposed biological link, if it is confirmed by more detailed studies, may speak to a biological link to the Paiute as claimed, however, the dental similarities also may be attributable to a common northeastern Asian ancestor of the Spirit Cave Man, the Paiute, and “eight other Native American groups.” The earliest (pre-Spirit Cave Man) ancestor who possessed these dental traits also may have given rise to numerous other groups, many of which may have become extinct. The Spirit Cave Man may have been a member of one of these now extinct groups rather than the group that gave rise to the Paiute. Regardless, even if a general biological link can be confirmed based on similarities in dental patterns, a common biological heritage does not establish a common cultural affiliation between the Spirit Cave Man and any particular modern group. Indeed, the extreme antiquity of the putative biological connection argues strongly against any demonstrable special and significant genetic or cultural relationship as required by the Bonnichsen test. Response: The occupational markers referred to in the claim would characterize nearly every hunting and gathering group in the history of the world that occupied “rough terrain.” These markers are not inherited traits. Instead, they are developmental features, which means that any group of people, regardless of their biological or cultural affiliation, that inhabited the Great Basin region from 13,000-years-ago up to the early historic era would exhibit the same occupational markers (see, for example, Brothwell 1972; Churchill and Schmitt 2002; Kennedy 1989; Kostic 1963; Landau and Steele 1996; White 1991). These characteristics have absolutely no bearing on the cultural or biological identity of the Spirit Cave Man remains. Response: Given the constraints on a general hunting and gathering way of life, it would be more remarkable if the Spirit Cave Man and his group had found any other way to make a living in the desert marsh environment of the Western Great Basin. The fact that two groups of hunter-gatherers, separated by thousands of years, exploited a similar environment in similar ways is a simple reflection of the limitations of that environment and the capabilities of all humans to take advantage of the opportunities such environments afford. 6. Claim: Cranial data, which reportedly indicate a lack of biological and cultural continuity between Spirit Cave Man and the Fallon Paiute-Shoshone Tribes, are asserted to be “irrelevant” for a variety of reasons. Response: The cranial data could be better addressed by biological anthropologists, but the Tribe’s claim here is not that cranial data support the argument for cultural and biological affiliation, but merely that they do not categorically refute the argument. 7. Claim: “The woven mats and rabbit-fur robe found with the Spirit Cave remains” are similar to the basketry and textiles used by the immediate ancestors of the Fallon Tribe. Response: Basketry and textiles are ubiquitous in all regions of the world where the environment allows the preservation of such normally perishable materials. Such items are prominent in the archaeological record of the Great Basin because the climate is dry enough to prevent the decomposition of the material when it occurred in sheltered locations, such as caves and rockshelters. The environment dictated the material used for weaving. The tules have been growing in the Western Great Basin for millennia. Rabbits have been available over the same period. There is little else in this region that could have been used to make basketry and textiles. The mere fact that Spirit Cave Man’s group and the ancestors of modern Great Basin tribes both made use of these materials to weave mats does not provide any evidence for a biological or cultural link between the groups. To be persuasive, an argument for cultural affiliation would have to demonstrate specific weaving techniques or stylistic elements common to both the material associated with the Spirit Cave Man remains and functionally similar items made historically by the Fallon Tribe. Response: The alleged “pattern” encompasses such a variety of practices that it is hard to see how the burial practices that might have been followed by any number of hunting and gathering groups inhabiting this region would fail to be included in it. Hunting and gathering groups all over the world used a similar variety of burial practices, so the documented nature of Spirit Cave Man’s burial practices provides no definitive evidence for a cultural relationship with any particular Great Basin, or indeed North American, tribe. 9. Finally, the Fallon Paiute-Shoshone Tribe asserts that their claim to be culturally affiliated with the Spirit Cave Man remains is not undermined by the presence of “some gaps” in the record of evidence (see 43 C.F.R. § 10.14[d]). Response: While “some gaps” in the record might be understandable, the magnitude of the more than nine millennia gap separating the Spirit Cave Man and the emergence of the Fallon Paiute Tribe as a distinguishable cultural and political entity is so vast as to virtually preclude the possibility of establishing any specific and particular biological or cultural connection between them. Indeed, the OAC is not aware of a single case in which a modern-day Native American tribal group was traced reliably for more than a few centuries into the past. The many significant gaps in the various lines of evidence used to support the Tribe’s claim of cultural affiliation (refer to the BLM’s original determination that Spirit Cave Man was not culturally affiliated with the Fallon Paiute-Shoshone Tribe) actually are positive evidence for an absence of a meaningful biological or cultural connection such as would be required by the Bonnichsen test. In conclusion, none of the archaeological data presented by the Fallon Paiute-Shoshone Tribe in their lawsuit offer any substantive evidence for a significant biological or cultural link between the Tribe and the remains of Spirit Cave Man. Instead, all of the available data support the BLM’s original determination that the remains of Spirit Cave Man are not culturally affiliated with the Fallon Paiute-Shoshone Tribe. Furthermore, the available data cannot be used to support the claim that the remains are Native American, as that term is used in the NAGPRA. P.S. A version of these comments was sent to the Friends of America's Past on 1 December 2006, with the intent that they be sent on to your office. Therefore, you may already have seen a similar document. It was not, however, clear that your office would include this previous submission in your deliberations, so the OAC thought it prudent to revise and submit our comments directly to your office. 1972 Digging up bones. British Museum of Natural History, London. 2002 Biomechanics in palaeoanthropology: engineering and experimental approaches to the study of behavioural evolution in the genus Homo. In New Perspectives in Primate Evolution and Behaviour, edited by C.S. Harcourt and B.R. Sherwood, pp. 71-102. Westbury, West Yorkshire. 1989 Skeletal markers of occupational stress. In M. Y. Iscan and K. A. R. Kennedy, editors, Reconstruction of life from the skeleton, pp. 129-160. Alan R. Liss, New York. 1963 Facets and imprints on the upper and lower extremities of femora from a western Nigerian population. Journal of Anatomy 97:393-402. 1996 Why anthropologists study human remains. American Indian Quarterly 20:209-228. 1991 Human osteology. Academic Press, San Diego. After a month of supreme fundraising, a consortium of organizations (Arc of Appalachia Preserve System, Archaeological Conservancy, Wilderness East, and Ross County Park District) has saved the Spruce Hill site from the auction block. The Ohio Archaeological Council and its members pooled their resources and contributed $10,270 to the cause. But the battle to save Spruce Hill is not over yet! More money is needed to cover the cost ($612,000) of the Spruce Hill purchase. As of this writing, another $395,000 was needed to cover the loans used to make the initial purchase. You can give to the cause through the website of the Highlands Nature Sanctuary or through the Archaeological Conservancy. 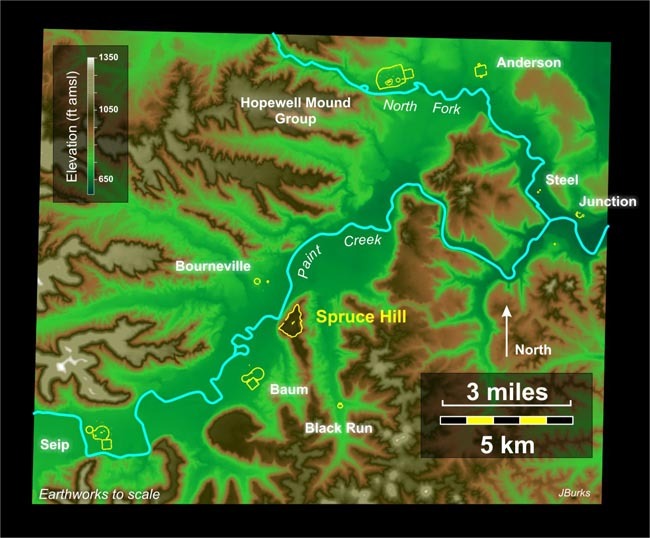 Spruce Hill (Figure 1) is situated on a large, mesa-like landform overlooking Paint Creek and the town of Bourneville. It is one of the largest Hopewell hilltop enclosures in Ohio, and it is one of the only such sites in Ross County, an area rich in large Hopewell earthworks and mounds. 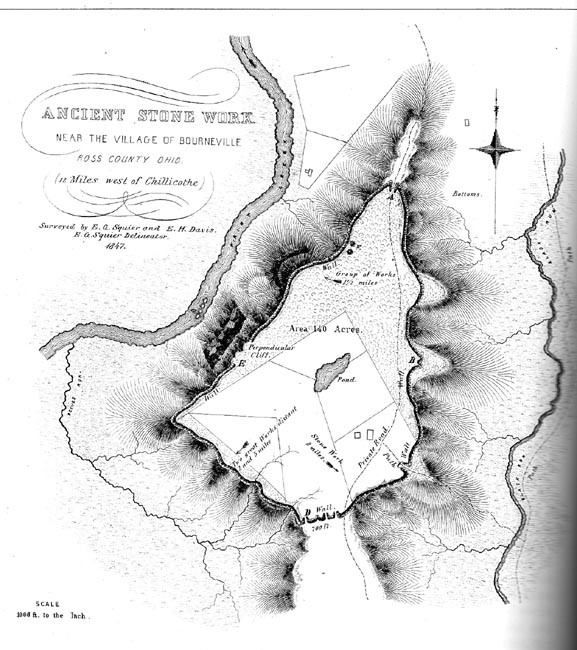 The first map of the site appeared in Caleb Atwater’s landmark 1820 publication on earthwork sites. Twenty-eight years later Squier and Davis (1848) gave the site a very prominent position (it’s the first site discussed!) in their famous volume on the Ancient Monuments of the Mississippi Valley (Figure 2). Since the mid-1800s, however, very little archaeological work has occurred at Spruce Hill. The Ohio Historical Society conducted a very small excavation there in the 1940s, though this did not yield any major publications. In the mid-1990s the National Park Service excavated in the gateways at the south end of the site, uncovering stone architecture and some of the first Hopewell artifacts to be found at the site—bladelets. Now that Spruce Hill has been purchased and is protected, we can begin the long process of thoroughly studying this important site. Work will begin this year with mapping and limited geophysical survey inside the enclosure. While we are a long way off from understanding the role Spruce Hill played in Hopewell ceremonial life, the site is now protected for future generations thanks to the hard work of all those involved.